Providing poor and needy people of the state with food grains is one of the main aims of central as well as the state authorities. People who fall below the poverty line get ration cards from state governments. It assists them in collecting food grains at low or subsidized rates. The same is applicable in Punjab. 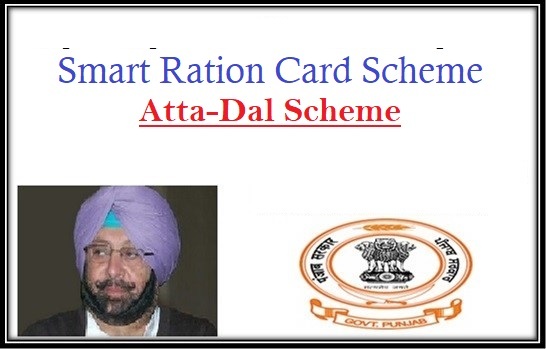 But the new state government has revamped an earlier scheme and named it Smart Ration Card Scheme. It will provide the same benefits as was provided by the previous scheme, but will enhance its implementation from the technological stand point. Providing food grains to poor and needy – The state authority of Punjab has implemented this food welfare scheme for making low cost food grains, mainly atta and dal, to people who are poor and needy. It will empower them and make sure that they do not stay on empty stomach. Sending grains directly to homes – As per this food grain scheme, each selected applicant will not have to worry about going to the ration shop to get their grains. The state authority will make arrangements to send the grains directly to the homes of the beneficiaries. Grains at low rates – People who are selected under this program will get food grains at low process. The state will give subsidy on the price of these food grains. Smart cards will be issues – To identify the beneficiaries, the state authority has decided that each will be given a smart card. This pass will replace the blue ration card that was issued by the previous government. Amount of pulses to be distributes – As per the draft of this scheme, each smart card holding household will be entitled to get 2.5 kg pulses. Cost of wheat under the scheme – Under this scheme, each smart card holding household will have to pay only Rs 2 for every kilogram of wheat they purchase. Number of beneficiaries – The previous version of this program reached out to around 30 lakh receivers. The new government wants to cater to those individuals and also reach out to more people. Part of Food Security Act – The development of this program was done in line with the National Food Security Act of 2013. Its aim was to ensure that poorest of the poor have access to food grains. Sponsored by the state government – As mentioned, all financial requirements, arising out of the implementation of this project will be provided by Punjab authority. Residential criterion – The scheme has been implemented only for benefit of people who are legal residents of Punjab. Anyone else, who does not fall under this category, will not be allowed to get the advantages. Income related criterion – Only people who have low income and fall under BPL category will be allowed to get food grains at low rates. Aadhar card – Just like other schemes, people who have access to their Aadhar cards will only be able to apply for this program. They need to provide Aadhar code as it will be seeded with the new smart ration pass. Residential documents – Any document that can prove that the applicant actually hails from Punjab will be allowed to get food grains at subsidized rate. Any legal residential document’s photocopy will make the cut. BPL card – Only people who belong to poor strata will be able to get food grains (dal and atta) at low price. Thus, each applicant must attach a photocopy of his/her BPL card with the registration from. Caste certificates – Apart from people with low purchasing power, individuals from backward castes as well get the benefits and so, thy need to attach respective ST, SC, and OBC certificates also. Antyodaya food pass – It is mandatory that each applicant has access to Antyodaya food pass. If this document is missing, then state government will not process that application. Passport sized image of the applicants – Applicants are required to attach a recently clicked passport sized snap with the applicant form. It will assist in identification of the respective person. How to apply for the Blue card? Though one can get details from the site, all applications are to be made via offline procedure. Any person who desires to get food grains from the state government at low prices will have to collect the application form from the Food officer’s office, located in each district. These application forms are also available from the office of the Taluks development department. The application form has many fields, which must be filled with the name, address, contact details, district or Taluka name. An image of the applicant must be pasted in the appropriate place. To make the application viable, a candidate will have to attach photocopy of documents with it. Make sure that all data is entered in this form in proper order. To submit this form, every candidate can either go to the nearest Gram Panchayat office, Block Officer, or to the Zilla Parishad office. The applications will be forwarded to the respective department for verification from these offices. Use of technological advancements, will aid proper tracking of distribution of food grains. The seeding of Aadhar details with this new smart food pass will replace all documents and will also make the verification procedure easy. This pass will make sure that only deserving candidates are getting these benefits. As per the latest updates from the Punjab state government, a new ration card scheme has been announced for launch at June. The new initiative was taken by the state Minister Bharat Bhushan Ashu (Minister for food and civil supplies in the state). The new system launched is designed to eliminate leakage, diversion and pilferage and to offer with maximum transparency within the TDPS (Targeted Public Distribution System). The new system will ensure that entitled quota of ration will reach to each of the deserving beneficiaries via ePoS (Electronic Point of Sales). The system is currently supporting over 1.37 crore individuals (35,26,775 families) with in the state. As per the norms, it is expected that each beneficiary should seed his or her Aadhar Card details to get the benefit. Government has also succeeded to link over 98.24 percent individual families to the system. The new system is also expected to eliminate fraudulent cases of bogus ration cards and beneficiaries.